The UK has been left looking like an "unreliable" and "incompetent" partner for international science, according to a committee of MPs. It is one of the conclusions in a report looking into handling of the "funding crisis" in physics research. The study pins much of the blame on the head of the main funding body, and says "urgent changes must be made". Chief of the Science and Technology Facilities Council (STFC) Keith Mason said he had already taken action. "A number of issues highlighted by the report have already been recognised by STFC, and I have taken decisive actions to address them over the past few months," the chief executive said. 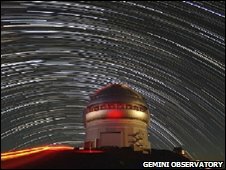 The STFC, which looks after some of the largest science centres in Britain, was faced with a deficit of £80m after an unfavourable government spending review last year. The council has had to try to reprioritise its spending but this has meant that some projects are now threatened with closure. 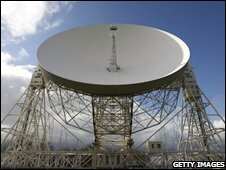 Facilities with an uncertain future include an upgrade to the iconic Lovell telescope at Jodrell Bank in Cheshire, the Daresbury National Laboratory and the UK infra-red telescope (Ukirt) - the world's largest telescope dedicated to infra-red astronomy, based in Hawaii. The fate of these and nearly 30 other projects will be decided later in the year. However, it was the handling of the process so far that came under attack in the report. In particular, the MPs on the Commons innovation, universities, science and skills committee criticised the "peer review" process by which projects were assessed and prioritised. They said they had found "weaknesses" in the system and had to conclude that it was "inadequate". This had been compounded by a series of internal reviews of scientific projects commissioned by the chief executive but never shared with the scientific community. "We are at a loss to understand how Professor Mason could think that secretive reviews would have anything other than a divisive effect on the community and undermine confidence in any of his future decisions." They also condemned "lamentable" communications, which had ultimately cost the STFC the "trust of the community". "We conclude that STFC's communications are inadequate, particularly its internal communications," the report said. "This raises serious questions about the role and performance of the chief executive, especially his ability to retain the confidence of the scientific community as well as to carry through the necessary changes." Some suggest this is a thinly-veiled call for Professor Mason's resignation. But a statement from the council of the STFC said the chief executive still had their full support. "Council believes that the executive and its new peer-review structure did a good job in developing a forward-looking and affordable programme within its allocations." It said that it had already "recognised and accepted" that it had to "consult more widely on its future programme and to improve its communication with staff and its research community." "Actions have been taken in each of these areas and plans are being put in place for further improvement." John Denham, the secretary of state at the Department for Innovation Universities and Skills added: "There is a recognition that some things could have been done differently and that the programme could have been communicated differently to the scientific community. "I think the issue now is actually moving on from that and the STFC showing over the next couple of months it has the ability to address the issues raised in the report." Both the government and the STFC said they would respond to the report in full in the future.